We would like to tell you a little bit about what makes Peaches special and why you should shop with us. 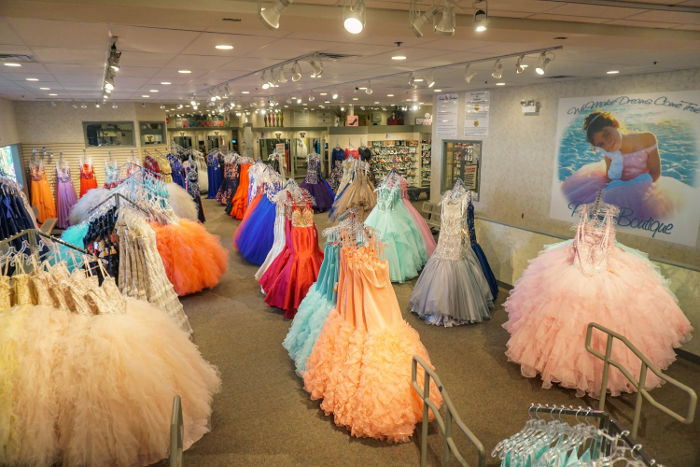 For starters, we have a 20,000 square foot store that stocks over 20,000 dresses. That's right, you will not find anyone else out there that carries that much stock, especially an online retailer. 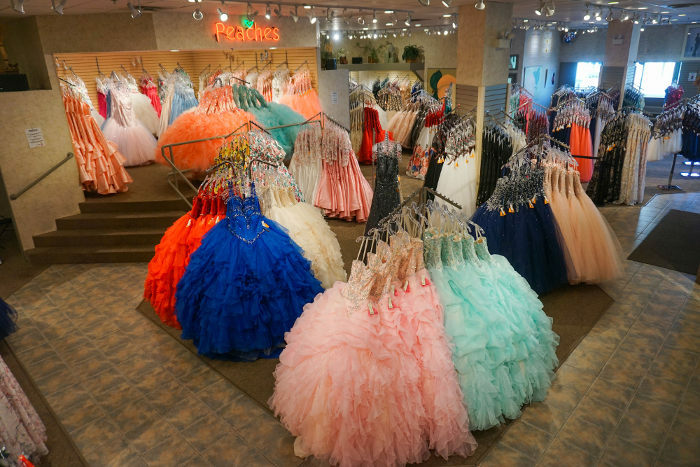 We register all the dresses sold at Peaches and maintain our motto of not selling the same dress in the same color to the same event. We have nearly every prom dress in every size and color from every prominent dress designer. This is extremely important in the prom industry because it has such a short selling season. If you are in a pinch in March or April looking for the hottest selling style, Peaches will have that gown for you because we order a huge quantity to begin with. No one wants to take a chance on ordering a dress and waiting 10 weeks to receive it! Most girls want to try their dress on and be able to take it home that same day to show off to their family and friends. At Peaches, that is exactly what you can do! Peaches is unique in that we dedicate 90% of our floor space to prom dresses. Many online stores only stock one size samples and do not even have a brick and mortar, not PEACHES. We like to think of ourselves as a tremendous retail store that warehouses all styles, sizes, and colors. 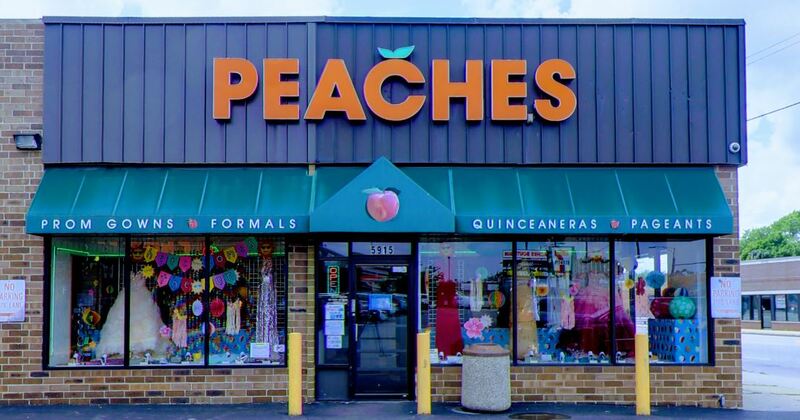 Whatever your event may be: Quinceneara, Sweet Sixteen, Pageant, Prom, Homecoming, Engagement, Wedding, and any other event, Peaches will have the dress of your dreams! While shopping for your perfect dress, our Peaches staff is fully trained to provide the best customer service imaginable. Our staff is fluent in Polish and Spanish and they will pamper you like a princess and make you look perfect from head to toe. At Peaches, the staff understands what styles are the most figure flattering for your body. We carry gorgeous gowns in every size imaginable, from sizes 0-30 IN STOCK! 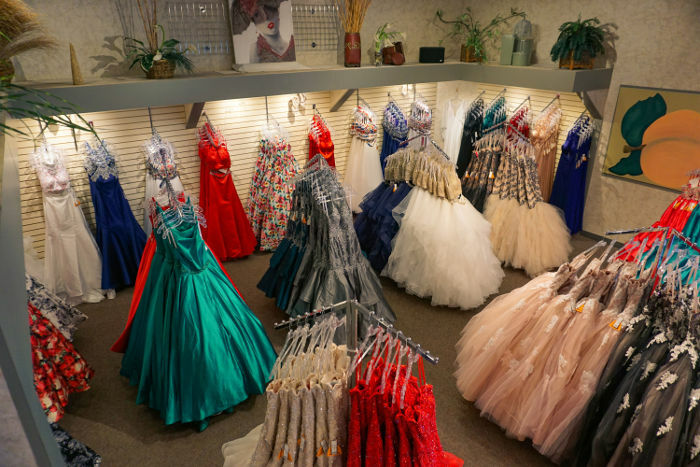 Whether you are searching for a curve hugging mermaid dress, an elegant A-line style, or a Cinderella style ball gown, we'll find the perfect dress for you! We carry stunning shoes and every accessory imaginable (earrings, necklace set's, bracelets, tiaras, headbands, and much more!). We also provide on site alterations. The same day you purchase your dress, you can get pinned for alterations and not have to worry about finding a seamstress that you do not know and trust. Peaches knows how important prom night is for you and that is why we strive to maintain our motto of never selling the same dress in the same color to the same event.